Karymsky (Kamchatka): The volcano had an explosion this morning that produced an ash plume that rose to 15,000 ft and drifted SE. Sakurajima (Kyushu, Japan): Activity has actually decreased and been relatively low at the volcano during the past days. However, the risk of a major eruption remains according to the Japan Meteorological Agency who maintains alert level 4 (preparation for evacuation). 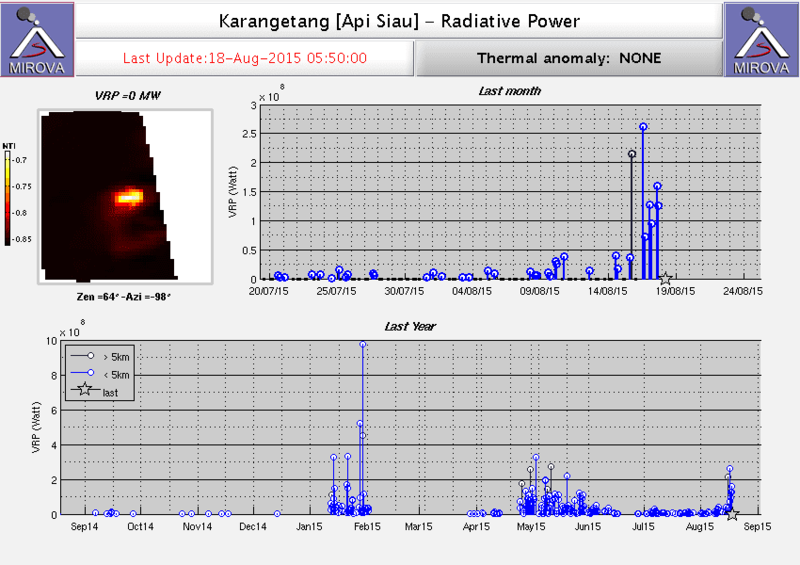 Karangetang (Siau Island, Sangihe Islands, Indonesia): Thermal signals from the volcano have been increasing over the past days, suggesting that the lava output at the summit crater has increased. This could again again to dangerous pyroclastic flows if the lava dome or lava flows become unstable on the steep upper flanks of the volcano. Such flows can easily reach inhabited areas. During the past months (at least since May) the volcano has been constantly active with a weakly alimented lava flow on the upper southern flank, which has been generating frequent incandescent rock falls. It decreased during July, but a new phase of more violent activity might be in the making now and could make new evacuations necessary. Alert level of the volcano remains at 3 (out of 4). Raung (East Java): It seems that at least some activity has resumed again. Several observers reported a light ash plume rising from the volcano and drifting SW.
Dukono (Halmahera): Ash emissions from the volcano continue to be intense. This morning, an ash plume extended 50 km ENE. Colima (Western Mexico): Explosive activity continues with sometimes relatively strong eruptions every few hours. Popocatépetl (Central Mexico): Activity at the volcano, relatively low at the moment, has remained more or less unchanged. Lava is slowly being extruded in the inner summit crater and occasionally produces small explosions and less vigorous degassing events ("exhalations"). Santiaguito (Guatemala): Activity at the Caliente lava dome remains essentially unchanged. Some explosions produced ash plumes of up to 500 m height and the eastern blocky lava flow remains weakly active. Pacaya (Guatemala): Weak strombolian activity continues inside the Mackenney crater and produces small plumes of gas and light ash. Glow is visible at night. Fuego (Guatemala): Activity has decreased during the past days. INSIVUMEH reported only few and relatively weak explosions occurred during yesterday. Turrialba (Costa Rica): After 3 months of relative quiet, a small eruption occurred at the volcano on Saturday (15 Aug). At 01:47, an explosion of gas and ash generated a plume that rose 500 m.
The activiy was preceded by more than five hours of sustained volcanic tremor and increased seismic activity since early on 14 Aug.
Cotopaxi (Ecuador): During the night and this morning, some relatively small explosions occurred at the volcano, producing plumes of up to 700 m height. Tupungatito (Central Chile and Argentina): A volcanic-tectonic earthquake of magnitude 3.2 Richter occurred under the volcano yesterday. The epicenter was at 8.2 km depth 25 kilometers northwest of the main crater. This might announce a period of unrest at the volcano.